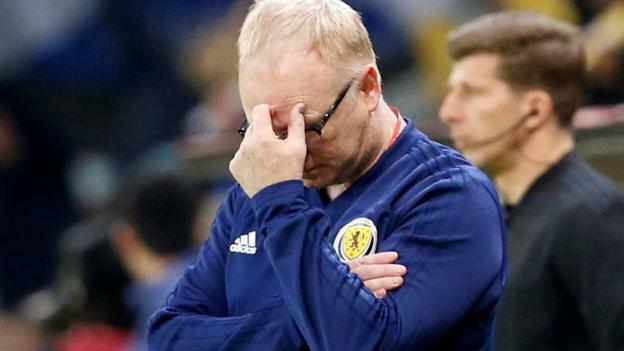 Alex McLeish refused to discuss his future after leading Scotland to one of the nation’s most ignominious defeats in their opening Euro 2020 qualifier in Kazakhstan. “I’ll continue to do my job and won’t get drawn into that,” said McLeish. Speaking to Sky Sports in the immediate aftermath of the abject defeat, the manager had conceded the result “possibly puts more pressure on me”. Scotland were guilty of abject defending at all three goals and offered little threat going forward against the country ranked 117 in the world. McLeish was forced to field a makeshift backline after several withdrawals and the team’s inexperience was cruelly exposed. “It was a poor night for us defensively,” said the Scotland boss. “We had one chance just before they scored and I was thinking it was looking quite lively for us. “But they scored two quick goals and we never reacted. They could have been prevented with better positioning. “There’s a lot of inexperience in the squad. We have introduced a few new names over the last year or so and it can take time, but I know we don’t have time. In the other game in the section, Belgium beat Russia 3-1 in Brussels. It’s a very poor start to the campaign on the back of some poor performances in the Nations League. There will be a lot of pressure on the manager after this. The players looked completely lost. It didn’t look as if there was a clear idea of what they were trying to do. It really didn’t look like we had a game plan or the players didn’t understand what the game plan was. I’d be astonished if the manager’s not in charge for the San Marino game. We’re only a couple of days away. But how long does this continue? I really don’t know. But if there’s another performance like this against San Marino I’d imagine that would be it.